So what exactly happened to John after 1899? Where did he go? Why wasn’t he living with his family? Where and when did he die, and where is he buried? I knew that if I could find a death certificate for John there’d be a good chance his mother’s maiden name would be listed. I could then compare that name to the baptism record I found in Ireland. And if the names were the same, I’d have some very strong evidence of my exact Irish origins. Part 4 of this series ended with me turning to John’s FAN club to find out what happened to him. And because I was also in the process of researching his wife Annie’s family for my targeted DNA testing plan, I thought I’d start there. Annie Scanlon McDermott was born on July 1849 in Manchester England to Irish-born parents, John Scanlon and Mary Byrne1. Annie’s father John was a shoemaker and likely moved the family to England to find work around the time of the Great Famine in Ireland. I was able to find and order a copy of Annie’s birth record from the General Registers Office (GRO) in the UK. The process couldn’t have been easier. I had a PDF copy in my email within 48 hours. Annie’s civil birth record from the GRO. Click to enlarge. The record showed Annie’s mother’s maiden name as Mary Birn. 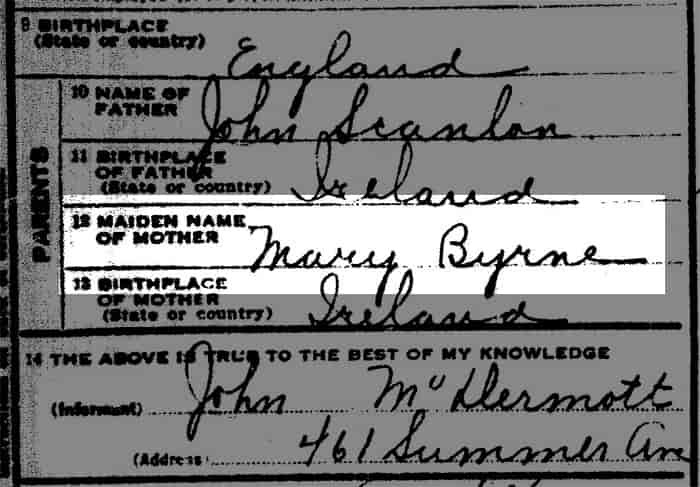 Annie’s death certificate in 1915 spelled the maiden name Byrne. The informant of this information was her son, John Jr2. Annie’s death certificate zoomed in. For good measure, I wanted to find out the correct spelling, so I decided to search for the original church record. More importantly, I wanted to be absolutely certain I had the correct family in England, because I was about to invest quite a bit of time tracking this family to present day for my targeted DNA testing plan. In order to find the church record, I first needed to find the church where the baptism took place. Unfortunately the government birth record did not list the church, the minister, or even the religious denomination. But it DID list where the family was living – Oldham Road in the Newton section of Manchester. A quick look on Google Maps showed me that Oldham Road was very long, so it was likely there would have been many churches along this road. I wanted to narrow it down to only a few before searching the records. At the time of my research, no website (not even FamilySearch) had city directories for Manchester for this time period. FamilySearch only had them on microfilm, which was not available for interlibrary loan. Fortunately, I was doing this research in the month of February and Rootstech was right around the corner. 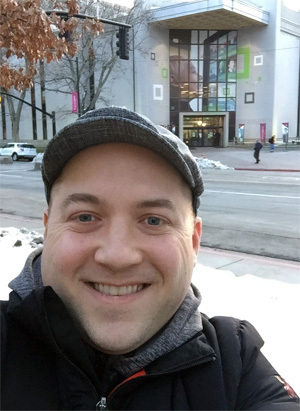 That meant an entire week in Salt Lake City, which is home to FamilySearch and the Family History Library! So one night, after a long day at Rootstech, I went over to the library to look at some of these city directories on microfilm. If you’ve never been to the Family History Library, I recommend it. The amount of records they have there is really unbelievable, and the staff are always happy to help. And since RootsTech is held every year right down the street at the Salt Palace Convention Center, it’s the perfect time to go. To my delight, the library had a film for the 1848 city directory of Manchester – one year before Annie was born. Scrolling through the film, I quickly found the Scanlon family. They were living near Oldham Rd at 18 Addington3. I now wanted to find a map of the area in this time period to find the closest Catholic church to that intersection. While the Family History Library has a nice collection of maps, it didn’t have the type of map I was looking for. And funny enough, my last session of that day at Rootstech just so happened to focus on maps. Amy Johnson Crow gave a terrific presentation. Among the many topics discussed, Amy pointed us to a few online resources to find older maps – one of which was the National Library of Scotland’s (NLS) website. Public service announcement: Amy has a really good genealogy podcast called Generations Cafe, which I highly recommend. 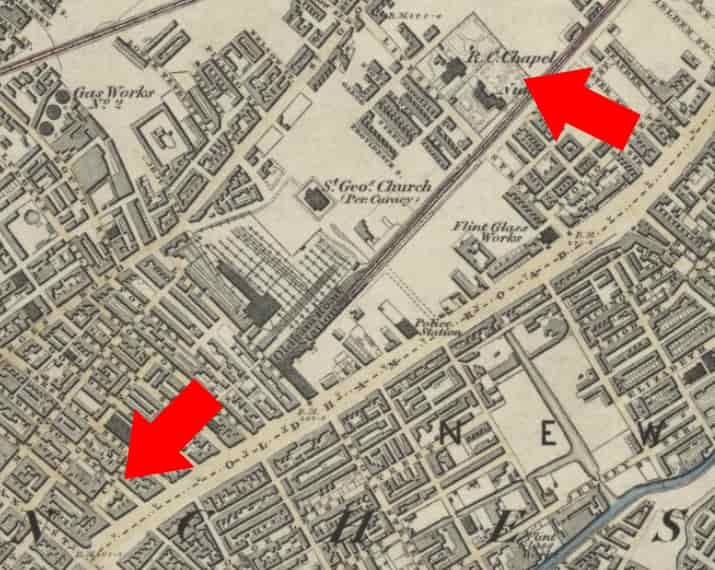 The NLS had a very detailed street map of Manchester published in 1848, and I was able to pinpoint the intersection of Oldham Rd and Addington St.
From there, I could see clearly that the closest Roman Catholic Church was St. Patrick’s Livesey. Again, no website had the sacramental records for this church online for the time period I was looking for. At the Family History Library, I was able to pull up the film for this church. I quickly scrolled to the baptisms in July of 1849, and spotted Annie’s name at the bottom of the page! At this point, I was very confident I was working with the right family, and that Annie’s birth record from the GRO was for the right person. The combination of U.S. census records and U.K vital records suggested that the Scanlons came to to America sometime between 1869-1870 and settled in Newark – the same city where John McDermott was living. As a side note, I thought it was also interesting that Annie’s father John and her husband John were both shoemakers. I wondered if that had something to do with how John and Annie met. Knowing I had the right family, I was ready to devote some more time to these Scanlons to see if they can help me figure out what happened to John. I had some ideas of how they might lead me to John’s death certificate. Annie’s mother Mary died in England in 1859 at the age of 315. In addition to Annie, her parents had two other children, John Jr. and James6. After Mary’s death, Annie’s father John remarried almost immediately to Mary Connolly7. They also had three children. Mary Connolly Scanlon then died ten years later in 18698. After the death of his second wife, John and his children left England and came to America where he remarried again in 1871 to Margaret Taafe9. John and Margaret would go on to have ten children. So John Scanlon was the father of sixteen children. That’s a lot of siblings and half-siblings for Annie, (and a lot a of very Irish names). Since I wasn’t able to find a death certificate for John McDermott, I wanted to shift my focus to burial records, which I hoped would lead me to his death certificate. Knowing that John McDermott was not buried next to his wife Annie and their children, and that he died before Annie, I thought there might be a chance Annie buried her husband in one of her family’s plots. With so many Scanlon’s running around Newark, I started to research some of the larger cemeteries in and around the city, hoping to find a family plot. I headed back to the State Archives in Trenton, and pulled some of the death certificates for Annie’s siblings and half siblings. They all seemed to be buried in the same cemetery right outside Newark, which is part of the Catholic Archdiocese of Newark. I knew that the Archdiocese of Newark had a website with a large database of internments. You can search for your ancestor, find the exact grave location, and see who else is buried in the same plot. It’s really a fantastic resource. Sure enough, a lot of the Scanlons were buried together in the same plot at this cemetery. That was great information to find, but I was really looking to find a John McDermott buried in the same plot with his in-laws. As far I could tell, there was no John. Several of the interments in this plot happened before John’s death. Meaning that while the plot probably would have been available at the time for Annie to use, it seemed like she chose not to. I decided I should also look at plots nearby. But the Archdiocese website did not return anything on John. If he wasn’t in this cemetery where all the Scanlon’s were buried, and he wasn’t in the cemetery where his wife and children were buried, then where was he? Everything about this mystery made me think that John must have left New Jersey, and had died and been buried there. That seemed to be the only thing that made any sense. Minutes away from throwing in the towel on this part of John’s FAN club, I had one last idea. I decided to do a quick search on FindaGrave. I first located the cemetery where the Scanlons are buried, then did a direct search in that database for John McDermott. A John McDermott who died in 1913. Why hadn’t this John come up in my searches before? I learned later that the section of the cemetery John was in was never indexed on the Archdiocese website. But just because I found a John McDermott didn’t mean that this was the person I was looking for. In fact, it seemed likely this was not the right John. This John died eight years after Annie first started identifying herself as a widow in census records and city directories. And where he was buried in the cemetery was not close to the Scanlon plot. In fact, he was on the opposite side of a what is a very large cemetery. 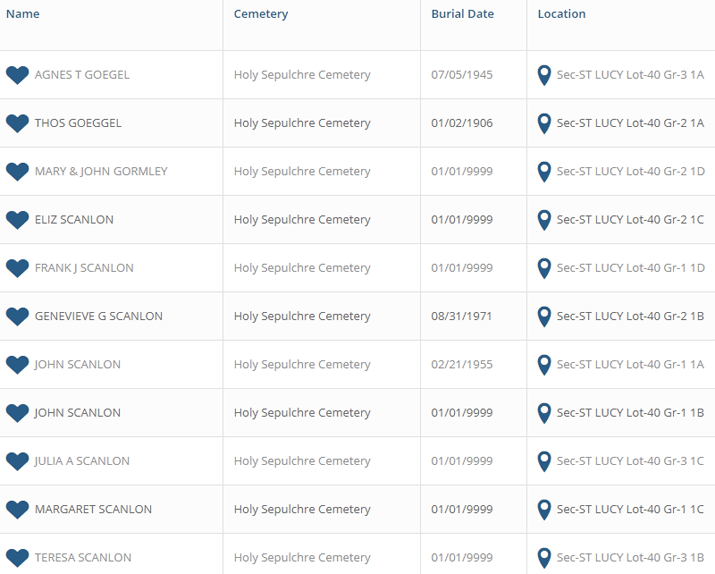 While John’s plot wasn’t indexed on the Archdiocese website, FamilySearch does have all the burial cards for that cemetery, which I’m guessing is the reason I was able to find the indexed record on FindaGrave. I located the original burial card at my local family history center10. I wanted to find out who owned the grave and if there were any other family members in the same plot. Unfortunately there wasn’t much information on the burial card, so I called the cemetery to see if they had any additional information. The only other information they could provide was that a “Mrs McDermott” purchased this single grave, and there were no other family members in the plot. Highland Avenue. Hmmm. It rang a bell. Where had I heard or seen that name before? Eagerly shuffling through my documentation, I found the research I had done on the Newark city directories. Now it all made sense. The reason I was never able to find John’s death certificate was because I was searching in the wrong years! Why was I so sure John had died earlier? As I mentioned, census records and city directories show Annie was widowed in 1905! Even with that knowledge, I still padded on an extra five years before and after in my research at the Archives. I had diligently searched the death certificates for each year between 1898 and 1910. But I never thought to search beyond 1910, because I didn’t think I had a reason to. The next morning I got in my car and headed down the NJ Turnpike. I was going back to the Archives in Trenton. I’ve been to the Archives many times over the years, and it’s consistently a 45 minute drive. But on this particular day, it seemed like it was three times as long. I was finally going to solve the mystery of John McDermott, and I couldn’t wait to get there. I arrived at the Archives just as they were opening the doors. I was greeted at the check-in desk by a familiar face,a staff member who had helped me on previous occasions with my search for the elusive John. “Today’s the day,” I told him as I made a beeline for the microfilm room. I went right to the file cabinets and pulled out the film for 1913 death certificates. Thirty seconds later, there it was: John’s death certificate12. 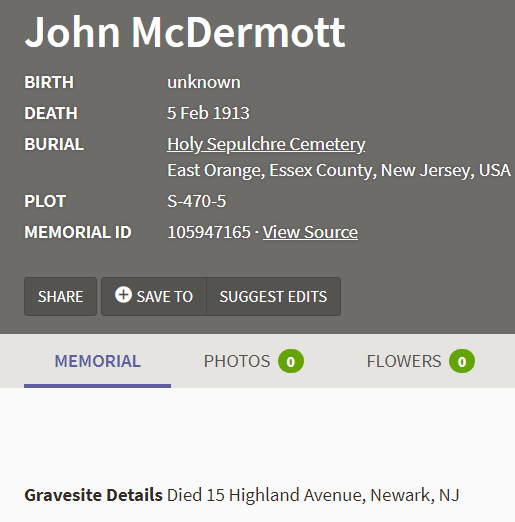 John McDermott died February 4th, 1913 at City Hospital in Newark, NJ. He was 66 years old, married, retired, and the son of Bartholomew and Katherine McDermott. Cause of death was senility and a fractured femur. His former or usual residence was 162 Lincoln Ave. This was the culmination of two years of research that took me from Trenton to Salt Lake and back to Trenton again. . . and again! Something that should have taken me two days to find, ended up taking two years. I was all too trusting of the the information in census records and city directories! Nevertheless, I was ecstatic. . . for about a minute. Unfortunately John’s mother’s maiden name was not listed on the certificate. This was one of the main pieces of information I was hoping to find when searching for John’s death certificate! 15 Highland or 162 Lincoln? But all was not lost. Now that I had an exact date of death, I ran over to the State Library, which has the Newark Evening News on microfilm. At the time, this paper had not been digitized and put online. When comparing this death announcement to his certificate, something stood out to me. 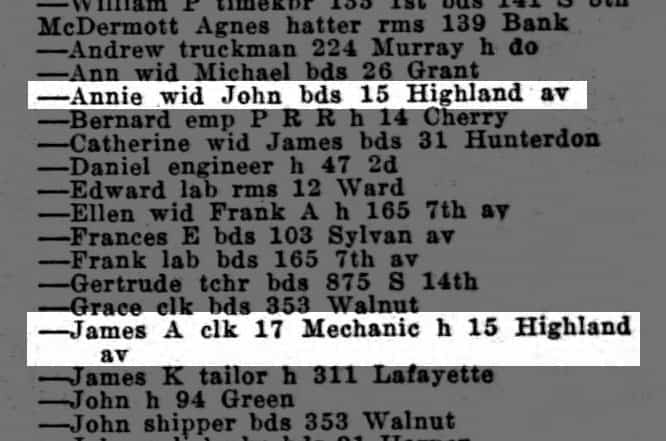 The death announcement said John was married, and that he was living at 15 Highland Ave – the same address the city directory listed Annie living at in 1913. But on John’s death certificate, his “former/usual” residence was NOT 15 Highland Ave. It was 162 Lincoln Ave.
162 Lincoln Ave was the home of John’s daughter, Catherine (Mrs. Bernard Conlan)14. So it would seem that John was living with his daughter for an unknown length of time before his death. I had long wondered if a separation between John and Annie was at the root of why he seemed to be “missing” from Newark later in his life. I hadn’t been able to find any divorce records, but the two different addresses for John and Annie in 1913 seemed to suggest that John and Annie had indeed separated at some point without a formal divorce. That could explain why Annie identified herself as a widow for so many years in census records and city directories. After all, in that time it would have been seen as an embarrassment for a woman to be divorced – especially amongst Catholics. It might also explain why John wasn’t buried next to Annie or their children, and why he wasn’t in the Scanlon family plot. So after years of research I concluded that John and Annie most likely separated and lived apart from each other for the last 10-15 years of their lives. Also you should always explore other possibilities, even if they don’t seem likely at first. Just because you can’t find a certain record (whatever it is), think of the other records you can find that might lead you to what you’re ultimately after. In my case, I needed to find the burial records for John, which then led me to his death certificate and announcement in the local newspaper. And to find those burial records, I had to spend some quality time with John’s FANs. I definitely had to learn these important lessons the hard way. But sometimes that’s the best way, and it certainly makes for a better blog post! England, birth certificate (PDF copy), Ann Scanlin, 1849; registered 19 July 1849, Newton District; General Register Office, Southport. New Jersey, Bureau of Vital Statistics, death certificate 11,277 (penned) (31 December 1915), Annie McDermott; State Archives, Trenton. Slater Isaac, publisher, Slater’s Directory of Lancashire 1848, microfilm, Slater’s General and Classified Directory of Manchester and Salford and the Whole of Lancashire and Cheshire, FHL roll 475,128 (Manchester: Slater, 1848), John Scanlan. St. Patrisk’s Livesey Street, baptism registers: 1832-1860, CD-Rom (Catholic Family History Society, 2007), Anne Scandlan; FHL CD-Rom. England, death certificate (PDF copy), Mary Scanlon, 1859; Sheffield District; General Register Office, Southport. St. Marie Cathedral Church (Sheffield, England), Baptisms 1840 – Dec. 1861, p. 249 (penned), James Scandling; FHL microfilm 1,941,821 and St. Marie Cathedral Church (Sheffield, England), Baptisms 1840 – Dec. 1861, p. 329 (penned), John Scanlan; FHL microfilm 1,941,821. St. Marie Cathedral Church (Sheffield, England), Marriages 1844-1942, unnumbered page, 27 September 1859, Joannes Scanlan and Mariam Conneley; FHL microfilm 1,941,824. England, death certificate (PDF copy), Mary Scanlan, 1869; Manchester District; General Register Office, Southport. Saint John’s Catholic Church (Newark), Marriages 1832-1983, p. 138 (penned), Scanlon and Taafe; digital images, FamilySearch (https://www.familysearch.org/search/catalog/217302 : accessed 29 January 2019); citing FHL microfilm 1,398,540. 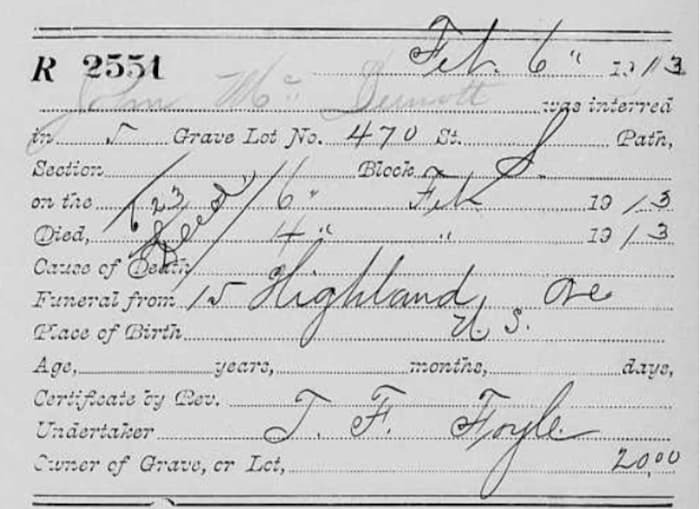 Holy Sepulchre Cemetery (East Orange, New Jersey), FamilySearch, database with images (https://www.familysearch.org : accessed 4 February 2019), John McDermott; FHL microfilm 1,381,909. Newark Directory 1913 (Newark: The Price & Lee Co., 1913), p. 1005, Annie McDermott; digital image, Ancestry (https://www.ancestry.com : accessed 1 February 2019). 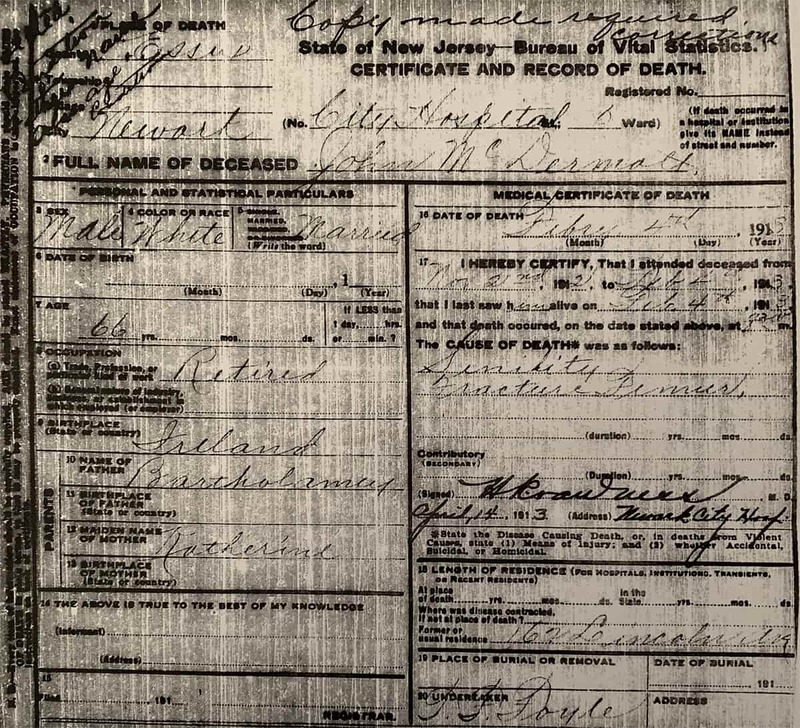 New Jersey, Bureau of Vital Statistics, death certificate corrected copy (4 Feburary 1913), John McDermott; State Archives, Trenton. “McDermott,” death announcement, Newark Evening News, 6 February 1913. Newark Directory 1913 (Newark: The Price & Lee Co., 1913), p. 559, Bernard Conlan Jr; digital image, Ancestry (https://www.ancestry.com : accessed 1 February 2019).